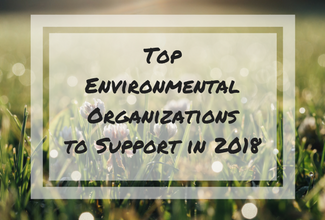 There are so many amazing people out there working with organizations doing important, powerful work on behalf of the environment. This post is dedicated to highlighting some of these organizations. If you are thinking of making a donation in the new year, consider making a monthly recurring donation to one of these organizations. As a side note, I believe a commitment to monthly recurring donations is superior to one-time donations spread out between organizations. When organizations are able to rely on a steadier stream of funds, they are able to focus more attention (& funding) on their programs and less attention on fundraising. Alternatively, it’s also valuable to support smaller, local organizations in your community. Take some time to find some local non-profit organizations doing important work – perhaps you can get involved as well. Lastly, if you’re short on cash, consider giving your time via online activism (i.e. signing online petitions, emailing your government representatives, etc. ).